Delays in diagnosis for people with Young Onset Dementia. Citation: Hussey JS, Butler G. Delays in diagnosis for people with Young Onset Dementia. J Ment Health Aging 2019;3(1):61-64. The timely diagnosis of dementia for people under the age of 65 years remains challenging in the UK because of variable referral routes to specialist assessment, complexity of diagnosis and the increased likelihood of a rarer form of dementia which requires further investigations. This study investigates the time to diagnosis and number of consultations for patients subsequently diagnosed with young onset dementia who were referred to a local Neurology service and/or Memory Clinic. A retrospective audit of case notes and clinic letters was carried out. The average time from GP referral to diagnosis was 9.7 months. This is quicker than reported in other studies, but the service described has a referral care pathway and good post diagnostic support. Nevertheless 72% of patients received two to five consultations and 7% between five and ten consultations before a diagnosis was made. 60% of people referred to Neurology services took over 6 months to receive a diagnosis compared with 30% of people referred to the Memory Clinic. YOD patients seen by neurology services took on average 6 months longer to receive a confirmed diagnosis than patients who were seen by the Wokingham Memory Clinic. Further research is needed to investigate the symptom and demographic profiles of those referred to the respective services. There are merits to assessment and follow-up within both Neurology and Memory Clinic services and this paper advocates for more joined up working between the two disciplines and commissioning of a care pathway for people with young onset dementia and complex dementia which could reduce the time to diagnosis and the need for multiple specialist assessments. Young onset dementia, Multiple referrals, Delays to diagnosis. In 2014, the Alzheimer’s Society published updated prevalence rates using an Expert Delphi Consensus methodology and estimated that 42,325 people were living with young onset dementia in the UK . Young onset dementia, defined as dementia under the age of 65, can present challenges to diagnosis. People may have atypical symptoms and are more likely to have a rarer form of dementia. There is also a heightened genetic risk. When dementia occurs at an early age, the psychological and social implications for both people living with dementia and carers are numerous. People with young onset dementia (YOD) are in a phase of their life when they would normally play an active role in society and family life and may have young children. The loss of these roles and responsibilities makes dementia in younger people different to that of older people. Younger people may also have to cope with specific issues such as marital problems, family conflict, unemployment and financial concerns with a consequent impact on carers . Traditional mainstream dementia support services are primarily aimed at older people and are ill-equipped to address these specific needs. As a result, GPs are often confused about where to refer younger people with suspected dementia and, furthermore, there are few designated services in the UK which are commissioned to investigate the diagnostic challenges of YOD and provide age-appropriate aftercare. One significant obstacle to accessing post-diagnostic support remains the delay in the time to diagnosis. The INSPIRED study showed an average time to diagnosis for YOD was 3.2 years and to diagnosis sub-type was 4.7 years . The Need YD study reported 4.4 years to diagnosis compared with an average of 2.2 years for someone with late-onset Alzheimer’s disease of comparable severity . Timely diagnosis is one of the most important aspects needed for a better level of support and lower stress levels in the process of adapting to life with YOD [5,6]. Factors which have been shown to influence the time to diagnosis for a younger person include: under recognition; psychiatric misdiagnosis; and lack of or disordered care pathways resulting in multiple referral routes. This prevents continuity of care which is a crucial factor for an experience which is patient-centred and reduces carer stress levels . The Wokingham Memory Clinic is part of an Old Age Psychiatry service in Berkshire and has an agreed referral guideline with local Neurologists. Referrals also come, however, from community adult mental health teams and a regional Cognitive Disorders Clinic. The guideline encourages GPs to refer people with neurological symptoms or signs or rapid change in symptoms to Neurologists. If young onset dementia is considered, the Neurologists copy the Memory Clinic into correspondence and a diagnostic or review appointment with the Memory Clinic organised. Otherwise referrals of people of any age are referred to the Memory Clinic for assessment of possible dementia. The Memory Clinic has a Psychologist and Speech and Language Therapist who provide neuropsychometric tests and language assessments and there is access to MRI or CT head scans. There is opportunity for the Memory Clinic to refer directly to Neurology if appropriate. After receiving a diagnosis, people living with young onset dementia are referred to the Younger People with Dementia Berkshire CIO charity YPWD Berkshire). The charity provides a wide range of workshops tailored to younger people with a diagnosis of dementia with activities such as table tennis, cycling, katakanoeing, art, photography and participation in a choir. The focus is on activities which people would normally wish to carry out in their late 40s and 50s and with a level of vigour appropriate for their age. Other workshops provide cognitive stimulation therapy, age-appropriate reminiscences and opportunities to be creative and learn new skills. In doing so they also provide social connection with people of the same age. The charity also provides 1:1 support, from an experienced support worker. It provides further support through delivery of educational courses. Admiral Nurses offer psychological and practical support for carers and there is a young onset dementia care adviser. A recent report demonstrated that patients and carers who accessed YPWD Berkshire charity support reported lower carer stress levels . Prescribing of anti-psychotic drugs was lower than in other community studies and behavioural psychological symptoms of dementia (BPSD symptoms) were halved at 24 months compared with baseline. Carers also reported, using semi-structured questionnaires, that their relatives demonstrated improvement in mood and confidence and that they benefitted from social connections and building friendships with other carers. Despite such opportunities for psychosocial support in Berkshire, timely diagnosis and access to age appropriate services, more generally, across the UK, remains a significant challenge for many younger people with dementia. With these considerations in mind, the current study aims to explore the time to diagnosis for people with YOD within an Old age Psychiatry Memory Clinic in Wokingham which offers YOD assessment and age-appropriate support. The NHS records of 71 patients with YOD open to the Wokingham Memory Clinic were retrospectively audited. Gender; age at diagnosis; time from GP referral to diagnosis and diagnosis sub-type were recorded. The initial GP referral letter was used to determine the time of referral to the memory clinic. The time of diagnosis was ascertained from information recorded in the memory clinic letter to the GP or on the electronic patient record (RIO). The number of times seen by Neurology, the Cognitive Disorders Clinic, General Adult Psychiatry and the Memory Clinic were counted. The number of visits to Neurology was based upon the number of clinic letters documenting each consultation, although this may be less accurate because we could not access the Neurology Clinic notes directly. The time from diagnosis to first psychosocial intervention was also recorded. 9 patient records were excluded from the audit as there was no initial GP referral letter so the time to diagnosis was unclear. 62 remaining patient records were audited for this study. The patient population consisted of 31 females and 31 males with ages at diagnosis ranging from 42 years old to 69 years old with a mean age of 61.4 years old. 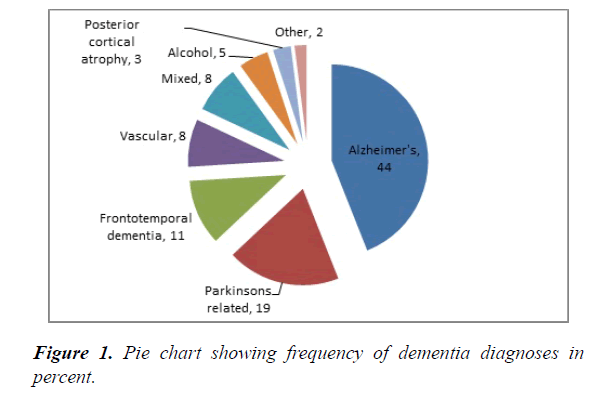 All subtypes of diagnosis of dementia were included in the audit; the most common diagnosis was Alzheimer’s disease (AD) in 44% of patients as shown in Figure 1. Figure 1. Pie chart showing frequency of dementia diagnoses in percent. The average time from referral to diagnosis was 9.7 months with a range from 1-48 months. Of the 62 patients: 38 had previously attended neurology services where diagnosis was made; 23 patients were not seen by neurology with a diagnosis being made in the Memory Clinic; and 1 patient’s record was unclear and was excluded from this analysis. 21% of patients had one consultation and 72% had between two to five consultations before receiving a diagnosis (Table 1). One patient, with a complex presentation was seen 10 times in Neurology. Another patient was treated in General Adult services for depression before receiving a diagnosis of front temporal dementia. The most common number of consultations in Old Age Psychiatry was two before diagnosis and this may reflect the need for an initial consultation followed by further diagnostic tests such as brain scan and neuropsychometric tests. Table 1. Number of consultations before diagnosis was made in any specialty. Patients who were referred to neurology before diagnosis took an average of 9 months to receive a confirmed diagnosis, with 60% of patients taking 6 months or more from time of GP referral. In comparison, patients who were not seen by neurology took an average 3 months to receive a confirmed diagnosis with only 30% of patients taking 6 months or more to receive a confirmed diagnosis from GP referral (Table 2). It was also found that those patients who were diagnosed within less than 6 months had on average 2 specialist consultant outpatient appointments and those who were diagnosed over 6 months after referral had on average 3 specialist consultant outpatient appointments before a diagnosis was made. It took an average of 10.9 weeks (range 1-39 weeks) after diagnosis of YOD for patients to receive psychosocial intervention. 65% of people had received psychosocial intervention within 8 weeks of diagnosis. This is because they were offered referral to the YPWD Berkshire charity on confirmation of diagnosis within the Memory Clinic. Those people given a diagnosis in neurology services would be offered this once transferred to the Memory Clinic. Table 2. Time from GP referral to diagnosis. Overall, the time to diagnosis of young onset dementia was quicker than in other published studies. This may reflect that the Wokingham service has developed a care pathway with local Neurologists and have formed links with the regional Cognitive Disorders Clinic. In spite of this, patients however, still received multiple consultations before diagnosis. The audit results have indicated a key finding between the time of diagnosis in YOD and whether patients were seen by neurology services prior to diagnosis. The audit shows that YOD patients who are seen by neurology services took on average 6 months longer to receive a confirmed diagnosis than patients who were seen by the Wokingham Memory Clinic. There may be important referral bias with GPs referring patients with more complex and atypical symptoms, suspicion of neurological deficits or younger patients to Neurology first. Therefore, the increased time to diagnosis could in part reflect increased diagnostic complexity. There are advantages and disadvantages to assessing patients with YOD at the local memory clinic. Typically such clinics are multidisciplinary, provide psychosocial interventions and are more able to support people with challenging behaviour. One advantage is continuity of care, something which Bakker et al. found to be very important in reducing carer stress levels and creating more patient-centred care . Secondly, it reduces waiting times, frequency of consultations for patients and in turn produces a quicker time to diagnosis. In addition to patient and carer benefit, this reduces demand on outpatient services. When a quicker diagnosis achieved, patients and carers can access vital support and education required to adapt to a life with YOD. Research from Bakker et al. and Carter et al., have shown that accessing this support earlier can reduce carer stress [5,6]. In this study two-thirds of people who were diagnosed with YOD had access to psychosocial intervention within 2 months of diagnosis. One important disadvantage of not referring a patient to a neurologist before diagnosis is that a reversible neurological illness could be missed and dementia could be misdiagnosed. Many Old Age Psychiatrists do not feel they have the confidence or skills in the diagnosis and management of YOD. Some Memory Clinics in the UK are psychology or nurse led and may not offer first-line medical overview including physical or neurological examination. Furthermore, access to more specialist neuroimaging, neuroradiology opinion and CSF examination, where appropriate, is often more limited. Additionally, Neurology services and in particular Cognitive Disorders Clinic may offer greater research opportunities for patients. Diagnostic confidence could be increased by memory clinic consultants referring to neurology after assessment but, as this study shows, it is likely to increase the number of consultations for patients. Across the UK, there is variability of services and expertise for YOD offered by both neurology and old age psychiatry services. Access to tertiary Cognitive Disorders Clinics is also variable and may be less geared to offer psychosocial and carer support. The Young Dementia Network has published a young onset dementia pathway highlighting the need for collaborative working and access to expertise in the assessment and diagnosis of younger onset and rarer dementias and has produced a Young onset dementia pathway . The Faculty of Old Age Psychiatry has also produced updated guidelines which recommend training opportunities and collaboration to utilise and combine the unique skills of both neurology and old age psychiatry services in a more joined up way . Further work is needed to embed good practice guidelines. Such an approach nationally could help to improve delays to diagnosis and the experience of those living with young onset dementia. A limitation of this study is that it did not explore other factors such as age or subtype of dementia which may influence time to diagnosis, as numbers were small. Future research suggestions would be to explore the link between patients being referred to adult mental health services or in ageless services prior to a diagnosis of dementia. Dementia UK Update. London: Alzheimer's Society. 2014. Kaiser S, Panegyres PK. The psychosocial impact of young onset dementia on spouses. Am J Alzheimer's Dis Other Dement. 2006;21(6):398-402. Draper B, Cations M, White F, et al. Time to diagnosis in young-onset dementia and its determinants: The INSPIRED study. Int J Geriatr Psychiatry. 2016;31(11):1217-24. Van Vliet D, de Vugt ME, Bakker C, et al. Time to diagnosis in young-onset dementia as compared with late-onset dementia. Psychological Medicine. 2013;43(2):423-32. Bakker C, de Vugt ME, Vernooij-Dassen M, et al. Needs in early onset dementia: a qualitative case from the NeedYD study. Am J Alzheimer's Dis Other Dement. 2010;25(8):634-40. Carter JE, Oyebode JR, Koopmans RTCM. Young-onset dementia and the need for specialist care: a national and international perspective. Aging Ment Health. 2018;22(4):468-73. Hussey J. Younger people- an innovative partnership. The Journal of Dementia Care. 2016;24(6):20-2. Young Dementia Network. Young onset dementia pathway. 2017. Royal College of Psychiatrists CR217. 2018.